Here, the claim term on appeal is “entire oscillator disposed upon [an] integrated circuit substrate” as used in Tech Properties’ U.S. Patent No. 5,809,336. The patent is directed to a microprocessor system that has two independent clocks: A variable frequency CPU ring oscillator clock and a fixed frequency quartz crystal I/O clock. The improvement here is in linking the variable frequency clock to the CPU so that the performance of both vary according to external stress (such as temperature) while not impacting the I/O clock speed. Following a Markman hearing, the district construed the oscillator term as being the variable-speed clock and requiring “an oscillator located entirely on the same semiconductor substrate as the central processing unit that does not require a control signal and whose frequency is not fixed by any external crystal.” Although the claims do not expressly include the negative limitation of no-control-signal and no-external-crystal for the CPU, the district court found that the prosecution history showed that the patentee disclaimed scope of its claims when attempting to overcome prior art rejections. Claim construction: The general process of claim construction is to interpret the claims according how a person of skill in the art (PHOSITA) would understand the claims in the context of the intrinsic record (patent and prosecution history). This standard process uses the intrinsic record to help give meaning to the claim terms. Phillips v. AWH. Disclaimer: Unlike the soft and seemingly flexible approach of Phillips, any disclaimer of scope must be “clear and unmistakable.” to one of ordinary skill in the art. Statements by the patentee that are either “ambiguous or amenable to multiple reasonable interpretations” do not create a disclaimer. Disclaimer is big because it allows the court to permissible add limitations from the specification and prosecution into the claims. 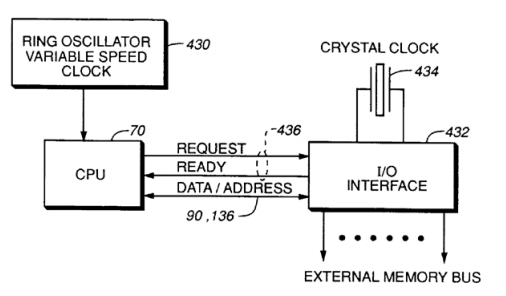 No fixed-crystal-clock: During prosecution, the patentee distinguished the prior art by noting that unlike the “variable speed clock as claimed”, the prior art “is at a fixed, not a variable frequency” and “relies on an external crystal.” For Judge Moore, these statements were sufficient to find that the patentee had disclaimed fixed-speed clocks from its entire oscillator claim scope. [T]he scope of surrender is not limited to what is absolutely necessary to avoid a prior art reference; patentees may surrender more than necessary. . . [W]e hold patentees to the actual arguments made, not the arguments that could have been made. The principle associated with this second point goes to the scope of disclaimer which follows the general principle that a patentee’s disclaimer only extends to the scope of what is actually disclaimed. On remand, the district court will need to decide whether this change impacts the prior non-infringement decision. Agreed. The only time an exception to this fundamental operating procedure should be allowed (and even then it’s not ideal) is when the term is unambiguously defined by the applicant in the specification (i.e., in a section entitled “definitions”) and the definition expressly and unambiguously includes the limitation being relied on. If the relied-upon limitation is just described as an optional embodiment in the specification or the feature is implied/inherent based on some necessary functionality, then the claim must be amended to include the relied-upon limitation (and amended in a fashion that complies with 112). It is also quite possible [and I have seen it in some file histories] that the examiner or even the attorney was careless, un-specific, or confused as to WHICH claim they were arguing as distinguishing over the prior art, where the application has several claims, only some of which which did actually contain the distinguishing words being argued. Dennis, had the patent attorney simply claimed a ring oscillator clocking the CPU and a second clock clocking I/O devices, he would have defined over the known prior art and not have had to argue so much and create so many disclaimers. The simpler claim, the better. Stick to structure. Stay away from functional claiming and explanations; they can only get you into trouble. Keep your arguments to a minimum. As they say, anything you say can and will be used against you in court. Claim 1 seems to have done that. I found the lingo in question in claim 6. Les, claim one is not exactly what I had in mind here. It includes a lot of explanation as to the theory of operation of the circuit and why it works the way it works, all of which is entirely unnecessary if one simply claimed structure. 1. A microprocessor system, comprising a single integrated circuit including a central processing unit and an entire ring oscillator variable speed system clock in said single integrated circuit and connected to said central processing unit for clocking said central processing unit, said central processing unit and said ring oscillator variable speed system clock each including a plurality of electronic devices correspondingly constructed of the same process technology with corresponding manufacturing variations, a processing frequency capability of said central processing unit and a speed of said ring oscillator variable speed system clock varying together due to said manufacturing variations and due to at least operating voltage and temperature of said single integrated circuit; an on-chip input/output interface connected to exchange coupling control signals, addresses and data with said central processing unit; and a second clock independent of said ring oscillator variable speed system clock connected to said input/output interface. 1. A microprocessor system, comprising a single integrated circuit including a central processing unit and … ring oscillator … connected to said central processing unit and clocking said central processing unit…; an on-chip input/output interface connected to exchange coupling control signals, addresses and data with said central processing unit; and a second clock independent of said ring oscillator variable speed system clock connected to said input/output interface. I don’t think so. What makes it unique and worthwhile is not only that it is on the same substrate, but that it is made with the same process so the characteristics of the components are matched and the stresses they are subject to are the same. Les, absolutely. But a Ring Oscillator is the only form of oscillator that is entirely on the chip and which operates entirely by transistors. Yes, but the ring oscillator could be made by a different process, or be made with different size transistors than the microprocessor and the result would no longer be the invented system. Are you aiming for a “describe a screwdriver” type of statement? I was discussing with Ned how claim 6 might have been written to avoid this case. Ned offered a suggestion. I was explaining why I thought there were issues with his suggestion. Your penchant against terms sounding in function merely highlights your desire to undo what Congress did in the Act of 1952.
anon, the penchant I display here is caused by the fact prosecution histories such as this that were necessitated in the first place by functional claiming. When one gets into court, one soon finds that functionally claiming anything results in endless claim construction battles that are in many cases centered on prosecution histories that are filled to the brim with disclaimers. Seriously, not the way to go, anon. Your Windmill Crusade against “functional claiming” is simply not in accord with what Congress did in 1952. That’s just a fact, Ned. *Apparently that now a fairly common way to halt D.C. patent suits for a Fed. Cir. appeal after a Markman decision, saving time and money for both parties and the Court. But it is only effective if the D.C. conducts the Markman hearing early enough – before extensive discovery and other trial preparation costs or a settlement to avoid them.